What Are the Benefits of Purple Corn Extract? Consult a physician before using any supplement to treat a medical condition. Monica Giusti, an assistant professor of food science at Ohio State University, led a team studying anthocyanins' cancer fighting potential. During the study, the team took anthocyanins from different plant sources, including purple corn, grapes, radishes, chokeberries, bilberries, purple carrots and elderberries, and compared the amount of each different type of anthocyanin it took to reduce in vitro cancer growth by 50 percent. 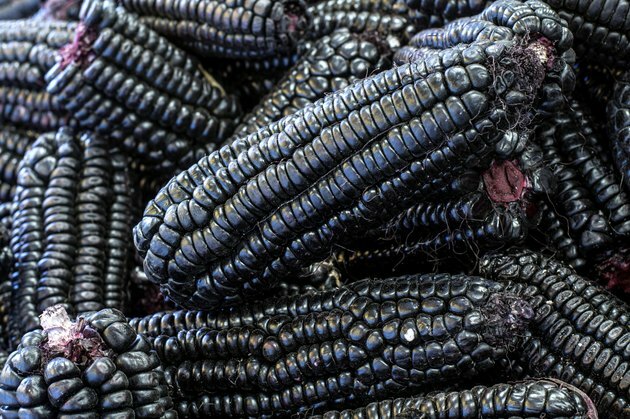 Anthocyanins from purple corn proved to be the winner; it took less anthocyanin derived from purple corn to reduce cancer growth by half than it did any other anthocyanin extract. During the study, researchers found that anthocyanins extracted from purple corn also killed 20 percent of in vitro cancer cells, while leaving surrounding tissue relatively unharmed. A July 2003 study published in the "Journal of Nutrition" looked at the anti-obesity potential of the purple corn anthocyanin C3G. The research looked at four groups of mice: one fed a high-fat diet, a second fed a high-fat diet and a purple corn extract that contained C3G, a third fed a normal diet and a fourth fed a normal diet and purple-corn extract with C3G. When the results were compared at the end of 12 weeks, rats fed the high fat diet with C3G showed less propensity toward obesity than the rats fed the high fat diet without C3G, despite the fact that there was no significant difference in caloric consumption between the two groups. The rats on the high-fat diet with C3G supplementation also showed no significant differences in fatty tissue weight when compared to the rats on the normal diets. Rats on the high-fat diet that consumed C3G did not show the propensity toward hyperglycemia and insulin resistance that rats on the high-fat diet without C3G did. The researchers concluded that purple corn anthocyanins may have the potential to fight obesity and diabetes. A 2002 study, published in the "Journal of Nutritional Science and Vitaminology," that looked at the potential health benefits of the anthocyanin C3G revealed that it reduced inflammatory responses in mice suffering acute chemically-induced inflammation. The researchers concluded that purple corn anthocyanins may have have potential treatment benefits for inflammatory diseases.